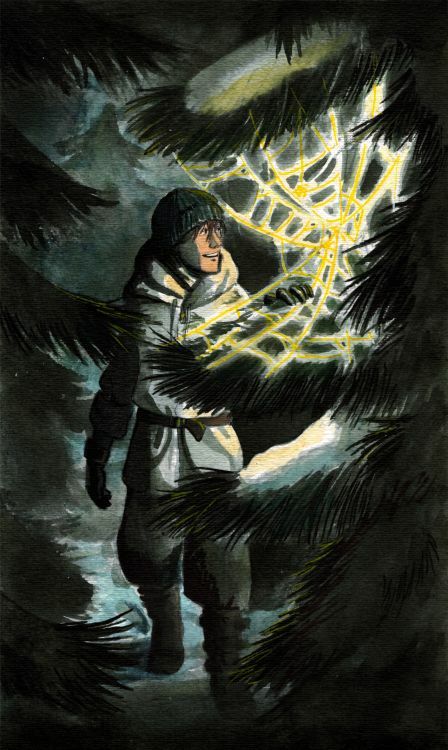 There's an old story from Yana's part of the world about a compassionate spider who spun Christmas decorations for a desperately poor family, so (see above). And see further above for the traditional spiderweb-shaped ornaments on their tree. Christmas there is actually in early January, but *shrugs*. Love both the page and the illustration. I generally really love the way you use light in your drawings. Wish I could claim to know the Brit's religion, but I'm not sure I can even discern the pendant right so that means I probably wouldn't know it in the first place. Merry Christmas! Thanks, one of my favorite things to draw! Very good to hear -- it's always interesting to try to show a bunch of senses visually only. That doesn't look like a miraculous medal, even with the figure in the middle or any other catholic symbol so that's out. Doesn't look like anyone Jewish religious symbol I know of, I thought some sort of torah necklace but I Googled it and it doesn't match. Doesn't fit my knowledge of any orthodox symbols either so I'm stuck. You should get props for dedication and correctly getting it's a monotheistic religion!